Delta today begins regularly scheduled passenger service with nonstop daily flights from the U.S. to Cuba. Flights will depart from Miami, New York-JFK and Atlanta to Havana as the airline makes its return to the Cuban capital for the first time in 55 years. Rules allowing regularly scheduled air service to Cuba from the U.S. are new this year. As a result, U.S. commercial air traffic to Cuba has expanded dramatically in the last 12 months. The U.S. Department of Transportation has authorized 1.2 million seats for trips to Cuba by commercial U.S. carriers per year, below the 3.4 million airlines requested, but representing significant revenue. Delta is the only existing U.S. carrier to previously operate passenger service until it was suspended in 1961 due to an unstable political climate and profitability challenges. Delta was also the last U.S. carrier to exit the Cuban market with the suspension of its Havana to New Orleans service. Delta Flight 625 is scheduled to depart Miami International Airport at 8:59 a.m. and touch down at Havana’s José Martí International Airport just after 10 a.m., making it the first official regularly scheduled Delta passenger flight since service was suspended in December 1961. Additionally, Delta Flight 448 from New York-JFK International Airport is scheduled to arrive just before noon and Delta’s Flight 639 from Hartsfield-Jackson Atlanta International Airport is expected to arrive just before 1:30 p.m.
Delta is among eight carriers granted authority by the Department of Transportation to serve Havana, and it began selling flights from the U.S. to Cuba in September. In early November, Delta became the first U.S. airline to open a City Ticket Office in downtown Havana to support local tickets sales for Cubans traveling to the U.S. Delta will offer almost 3,000 seats weekly between the U.S. and Cuba. 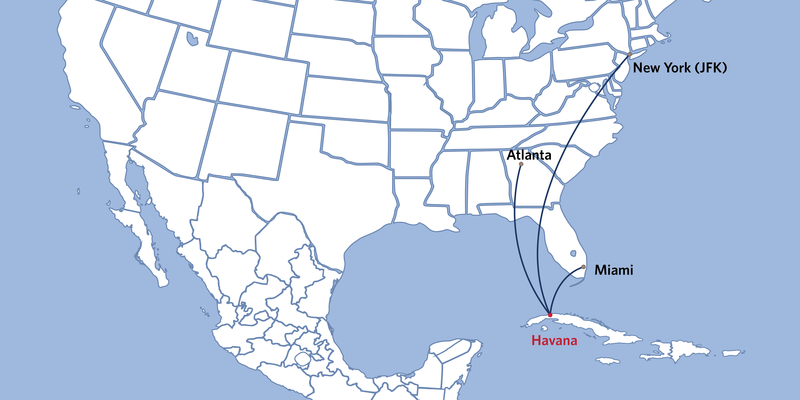 Delta’s Havana service from Miami and New York links the two top cities with largest Cuban-American population, while Atlanta represents the largest connection point of passengers to Havana providing more than 150 U.S. cities with one-stop access to Cuba from the world’s largest hub.